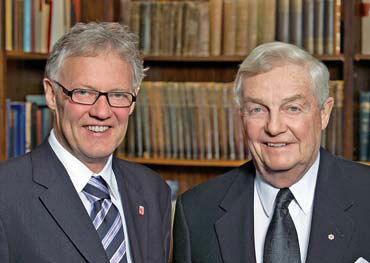 Epigenetics researcher Michael Meaney (left) with former Alberta premier Peter Lougheed. Meaney is the inaugural recipient of the $100,000 AHFMR Lougheed Prize in fetal and early childhood development. Anybody who doubts the immense impact that moms can have on our lives need only visit Michael J. Meaney’s lab. The associate director of research at the Douglas Institute Research Centre and a James McGill Professor of Medicine in the Departments of Psychiatry and Neurology & Neurosurgery, Meaney’s research indicates that a mother’s love not only soothes, it can effect changes in her offspring at the molecular level: Rat pups who receive plenty of grooming and other forms of TLC from their mothers tend to produce more receptors that control the production of stress hormones—and are therefore better equipped to deal with stress. These revelatory insights into the world of epigenetics (the study of changing gene function without changing the DNA sequence) was recently recognized by the Alberta Heritage Foundation for Medical Research, which named Meaney the inaugural recipient of the AHFMR Lougheed Prize in fetal and early childhood development. The prize awards $100,000 to an outstanding biomedical or clinical researcher. The AHFMR will also provide support for a postdoctoral fellow from Alberta to work in Meaney’s lab for up to three years. As the Lougheed Prize winner, Meaney will present public lectures in Alberta about his work and meet with scientists in the province who are also involved in child health research. The award is named after former Alberta premier Peter Lougheed, whose government created the AHFMR in 1980 with a $300-million endowment. For more information about Michael Meaney’s research, see “The Nurture of Things” in the Fall 2006 edition of Headway.